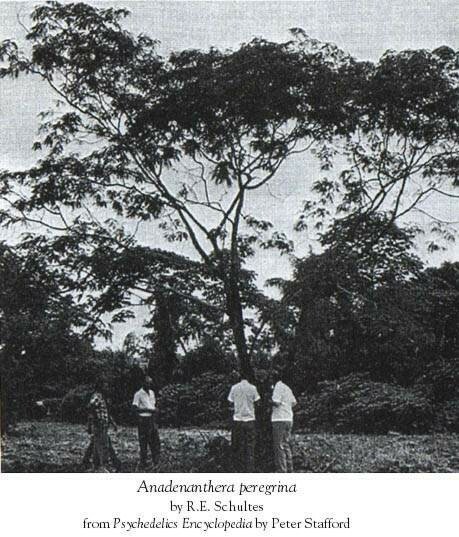 During Columbus' second journey to the New World, Spanish friar Ramón Paul did the first European observation of psychedelics-use involving cohoba sniffing, a powerful mind-altering means made from seeds of the yopo tree (Anadenanthera peregrina). The main psychoactive components are DMT (N,N-dimethyltryptamine) and 5-methoxy-DMT, which are also present in other trees, vines and shrubs and even in mushrooms. 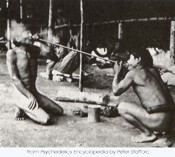 In most countries extracting DMT is illegal. There are four species of the Anadenanthera genus, the Peregrina species is called Yopo or Jopa and the snuff is named Cohoba. The other three species Colubrina, Excelsa and Macrocarpa also contain the same active chemicals, but the snuff is often called Vilca. The Indian tribes mostly snuff the toasted and pulverized Yopo seeds/beans mixed with ashes or calcined shells. Adding limestone to the powder will strongly enhance the visual hallucinations. A good Yopo to limestone ratio is 3:1. Combine it with some Banisteriopsis caapi powder to make the trip even stronger. This is a rather harsh method and can induce violent sneezing and heavy hallucinations. More often, these tryptamines are smoked a smaller amount is needed in order to feel the effects, which arrive in a matter of seconds. The smell and taste is like burning plastic when smoked and it is harder to smoke than hash. However there is no evidence that it is damaging. 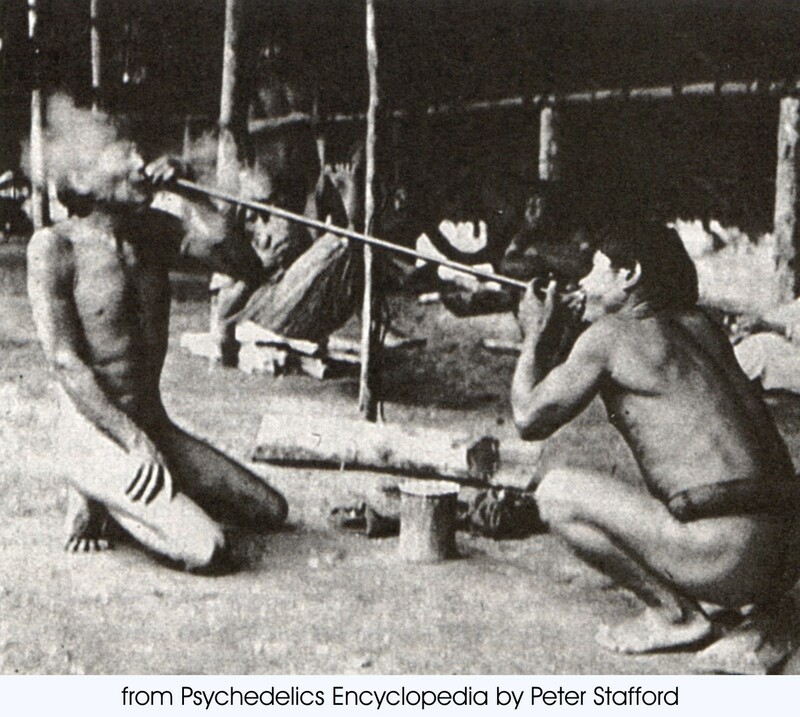 Because both methods require inhaling of the Yopo powder, it will allow the DMT to pass directly onto the blood. With sniffing the effects start in 5 minutes and last for 30 minutes. Small doses of Yopo (2-3 seeds) will generate light euphoria and minor (with eyes closed) hallucinations. Larger doses (4-5 seeds) will generate euphoria, stronger hallucinations and loss of bodily control. When smoked, the experience resembles that of smoking pure DMT. A smaller amount is needed in order to feel the effects, which start in a matter of just a few seconds. The peak lasts for three to ten minutes and will stop after twenty to thirty minutes.